There are unicorns, decacorns, and hectocorns. And then there is Apple. 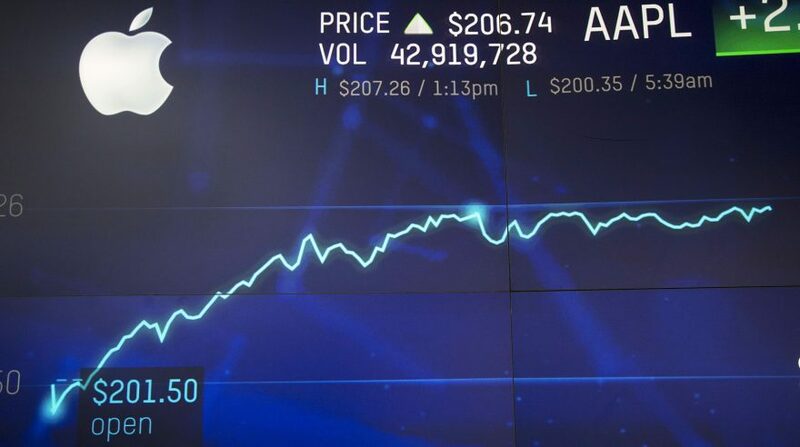 The Silicon Valley tech giant this week reached a valuation of $1 trillion, becoming the first U.S. public company to do so, when its stock topped $207.04 a share. That sent the company to lofty heights that defy investor superlatives like unicorn, which refers to companies that reach $1 billion valuation, and deca- and hecto-, labels for businesses that top the $10 billion and $100 billion thresholds. What do Apple’s good fortunes mean for its place in the education market, where it has struggled for the past few years? Apple’s identity among much of the public today is squarely tied to consumer products like the iPhone—not education. In schools, the company has lost market share in the mobile device market, particularly to Google Chromebooks and to a lesser extent Microsoft. Both Apple and Microsoft have sought to fight back against the encroachment of Chromebooks with different products, but Google’s position remains dominant. Earlier this year, Apple CEO Tim Cook personally announced the launch of a new version of the company’s 9.7-inch iPad, in an education-focused move. The company touted the fact that the $299 device supports the Apple Pencil, a tool for writing notes and illustrations. In the earnings call this week, Cook said Apple has seen “great momentum” with its Everyone Can Code and Everyone Can Create initiatives in schools and community colleges. More than 350 schools have agreed to weave the latter program into their curricula for the upcoming school year, Cook said. But there was hardly any mention of school products. A report from the market research firm IDC showed that the company continues to lead in the worldwide market for tablets. While the global market for tablets fell by 13.5 percent during the second quarter of 2018, Apple’s has the largest share, with 34.9 percent of shipments, a slight increase from the year before. Today, the portion of Apple’s business that comes from education amounts to a “rounding error” when stacked against the company’s prowess in the overall consumer space, observed Trace Urdan, a managing director at Tyton Partners who specializes in education. And the use of iPads and other Apple products in schools is certainly not what Wall Street cares most about, he said. Apple was a pioneer in the education market: Steve Jobs and his fellow entrepreneurs targeted the sector during the company’s early years. While it has seen its reach in K-12 erode, the company’s continued interest in education probably boosts its status among the public and in the broader market, argued Urban. And despite its weakened place in the K-12 market, Apple’s school devices are still regarded as the “gold standard” among some school buyers for quality—even if their prices are more than many districts can afford, Urdan said. Last year I reported on how four tech titans—Apple, Amazon, Google, and Microsoft—are jostling for territory in the K-12 space, though each of them has different interests in different segments of the market. Over the past year, a few of those players have made interesting plays in the landscape. Microsoft this summer announced the launch of a new device, the Surface Go, which it is betting will appeal to school customers as well as in the broader consumer market. The company bills the device, which starts at $399, as having the “mobility of a tablet and the performance of a laptop.In addition, earlier this year Microsoft announced it would integrate the curriculum of a provider of openly-licensed academic resources, Open Up Resources, into its classroom productivity suite Office 365 for Education. Open educational resources are materials that educators can share, annotate, and alter as they see fit, and they are seen as a challenger to traditional commercial publishers. Amazon continues to make inroads as a purchasing hub for K-12 schools. As my colleague Michele Molnar reported this week, one estimate says Amazon stands to gain $5.5 billion over the next 11 years through a cooperative purchasing agreement used by cities. Some critics worry that the process will shut out other businesses that serve school districts.Many districts are also relying on Amazon Web Services for cloud-based storage, as an alternative to physical, on-site services. Meanwhile, Amazon recently chose to get out of another, different segment of the K-12 market, when it announced that it was ending TenMarks, an online instructional support program in math and literacy. Check back on Marketplace K-12—and in EdWeek Market Brief—for our continued coverage of Apple and its rivals, and their strategies in the K-12 arena.